Proud parents David and Miriam Cameron of Clyde River Road are off to Brandon, Manitoba to watch their son Randy compete for the Memorial Cup with his team, the Moncton Wildcats. The four Cameron boys from Clyde River are well known for their hockey skills in PEI, as they have all played on teams at various levels. Randy Cameron has become well known for his outstanding performance with the Quebec Major Junior Hockey League since he was drafted in the 2007 NHL Entry Draft. Randy was selected by the Detroit Red Wings after an impressive season playing with the Summerside Western Capitals. 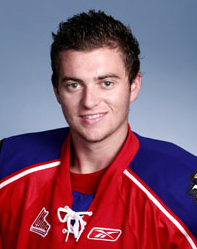 Randy shoots Right and plays Center ice and is one of four Islanders currently playing with the Moncton Wildcats. 2006-07: Randy Cameron played his first season with the Moncton Wildcats in the Quebec Major Junior Hockey League. He finished fourth in scoring among forwards for Moncton (QMJHL), scoring 17 goals and adding 22 assists in 70 appearances. 2008-2009 : 01/12/2008: Randy Cameron became the 27th player to register 100 career points with the Moncton Wildcats. He has 33 goals and 67 assists in 155 games. 12/ 10/2009 : Moncton Wildcats forward Randy Cameron and Chicoutimi Saguenéens goaltender Christopher Gibson today were named the TELUS offensive and defensive players of the week for the period extending from October 5 to 11.Cameron registered four goals and three helpers while posting a +4 rating in four games, helping the Wildcats win three out of the four contests. In each game, he recorded at least one point. The Wildcats are at the top of the Atlantic Division standings. The Moncton Wildcats rode Clyde River native Randy Cameron’s first period goal to a 3-0 shutout of the P.E.I. Rocket on Tuesday at the Civic Centre. Cameron, who added an assist, Ted Stephens and Daniel Pettersson secured Moncton’s fourth straight Quebec Major Junior Hockey League win and second shutout of the Rocket this season at the Charlottetown Civic Centre. Randy Cameron of Clyde River scored two goals to help the Moncton Wildcats to a 6-3 come-from-behind victory over the Cape Breton Screaming Eagles in Game 1 of their series Friday. Morgan Ellis of Ellerslie and Taylor MacDougall, who has family connections to P.E.I., scored for Cape Breton. Chris Doyle of Charlottetown had two goals and two assists to lead the Victoriaville Tigres to a 6-2 victory over the Shawinigan Cataractes in Game 1 of their series. Travis McIsaac of Uigg netted a power-play goal for Victoriaville. The Moncton Wildcats are now the Quebec Major Junior Hockey League champions and will battle the Western Hockey League’s Calgary Hitmen, Ontario Hockey League’s Windsor Spitfires and host Wheat Kings for the Memorial Cup starting Friday in Brandon, Man. Five members of the Moncton franchise have connections (with PEI). They are players Brandon Gormley of Murray River, Randy Cameron of Clyde River, Cole MacMillan of Winsloe, Devon MacAusland, formerly of Summerside, and general manager Bill Schurman of Summerside. Way-to-go Randy. The community of Clyde River is proud of your achievements. Your future looks bright in hockey fame. We’ll be watching.